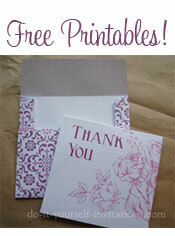 I fell in love with the paper from K&Company called K-Ology Blue Lace Column Flat Paper. It reminded me of blue jeans so I made the invitation envelope in the shape of a back pocket of a pair of blue jeans and added white stitching to enhance the look. 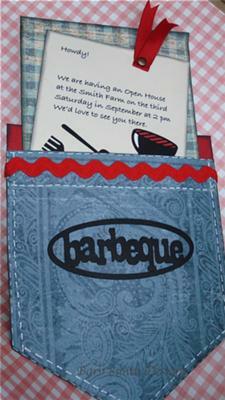 Red cardstock was used as the pocket lining as well as red rick rack to the pocket front. 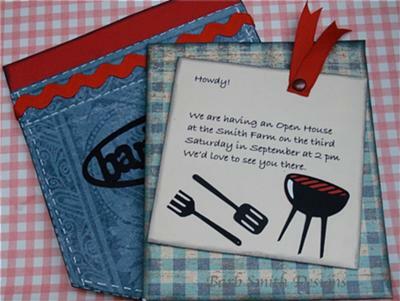 The invitation itself was printed on ivory card stock and glued to some blue and green gingham using foam dimensions. A pull tab was added to the invitation using red gross grain ribbon and an antique brass brad. 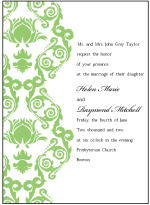 I edged both the invitation and the pocket envelope with Momento Tuxedo Black ink to give it an aged look. I added the barbecue embellishments with some die cut paper, but you could make these using barbecue stickers or stamps as well.